Saturday, June 23, 2012 marks the one year anniversary of the Government’s continued neglect to help families and communities suffering because of wind turbines placed too close to their homes. 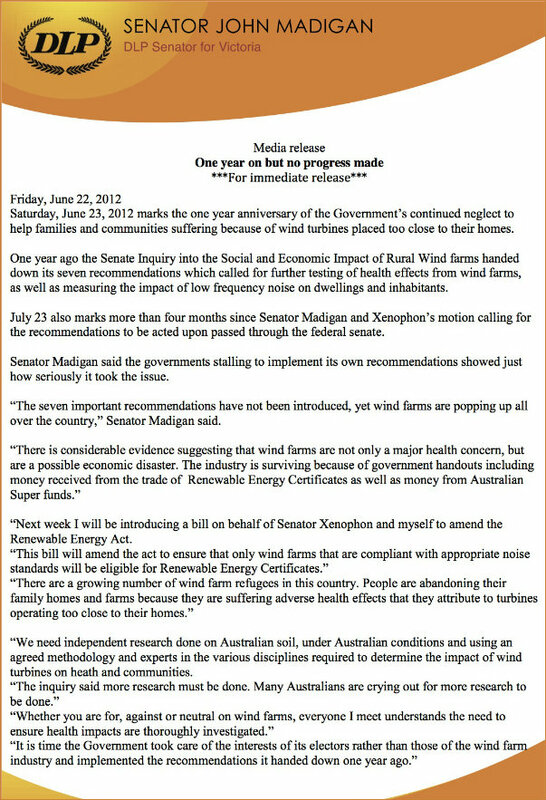 One year ago the Senate Inquiry into the Social and Economic Impact of Rural Wind farms handed down its seven recommendations which called for further testing of health effects from wind farms, as well as measuring the impact of low frequency noise on dwellings and inhabitants. July 23 also marks more than four months since Senator Madigan and Xenophon’s motion calling for the recommendations to be acted upon passed through the federal senate. Senator Madigan said the governments stalling to implement its own recommendations showed just how seriously it took the issue. “The seven important recommendations have not been introduced, yet wind farms are popping up all over the country,” Senator Madigan said. “Next week I will be introducing a bill on behalf of Senator Xenophon and myself to amend the Renewable Energy Act. “We need independent research done on Australian soil, under Australian conditions and using an agreed methodology and experts in the various disciplines required to determine the impact of wind turbines on heath and communities.